It has been a whirlwind 4 days. United lost Mark’s luggage and Mr. Angry was a little worried (as I would be if they had lost mine). My husband followed the day after we arrived and we wandered aimlessly around La Rambla the first 2 nights, eating at random tapas bars. 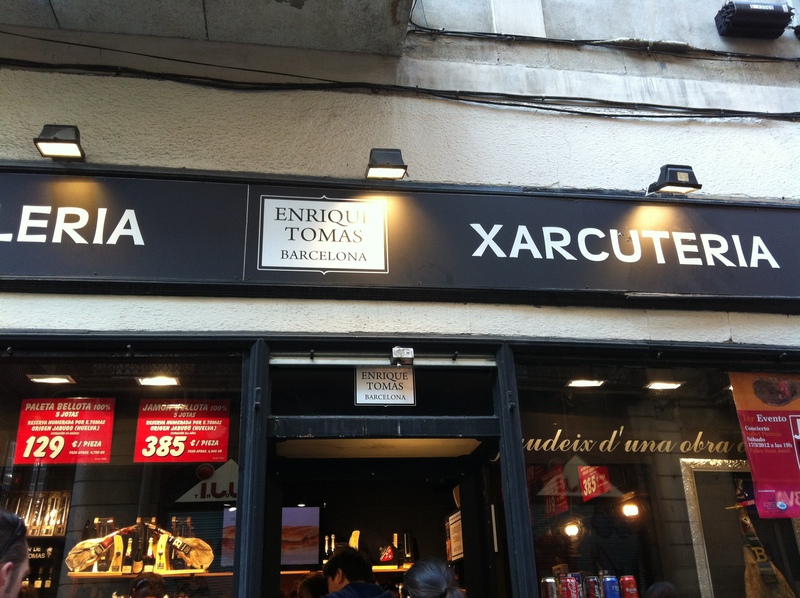 On day 1 with Carnet, we went rambling and found a great Xarcuteria (Charcuterie shop). We bought some rations, which were much needed at 2 a.m. on day 2. 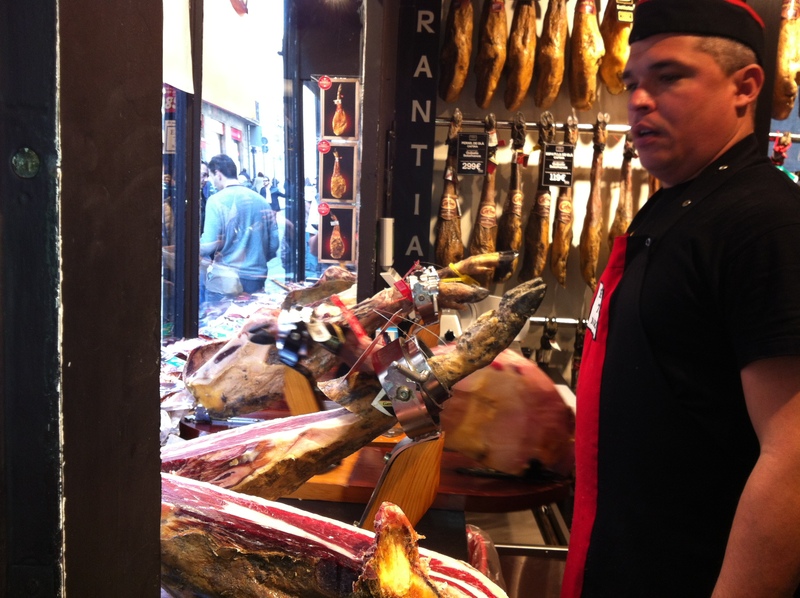 We purchased some Jamon Iberico (Spain’s famous ham, which was unbelievably delicious) and 2 different types of salami. Here’s the Xarcut guy who was slicing, and the outside of the shop. On a tip, last night Mark and I wandered to a restaurant in the ritzy part of town only to learn that it was a French restaurant. So, we promptly turned around and made our way to a down-home Catalan restaurant which served THE BEST bottle of Tempranillo for under 10 Euros. Love this place (Spain, in general). The vino tint0 is excellent, on average, and super cheap, compared to the red wine served in the U.S. It doesn’t matter whether it’s a rioja or tempranillo, the house wines are generally really good. I think it’s because the Spaniards demand no less. I’m going to need to temper my enthusiasm for the wine, I can already tell. On our way to finding our cute Catalan restaurant that served a gigante bundle of asparagus (first course, and they had me at “hello” with this one), we passed an Antonin Gaudi building. It was lit up in purple lights (see feature picture at top). Darling. I’m a big fan of Gaudi. When Carnet is done with Mobile World Congress on Thursday, I’m going to make us run through Barcelona to see all of my favorite sights, including the Miro Foundation which currently has an exhibit running of Miro posters from the late 19th-early 20th century. Tonight, I had my most favorite tapas at a darling 20 seat restaurant down an alley. I need some sleep, so my post tomorrow will start with this. ← Valentine’s Day Thai-ish food! 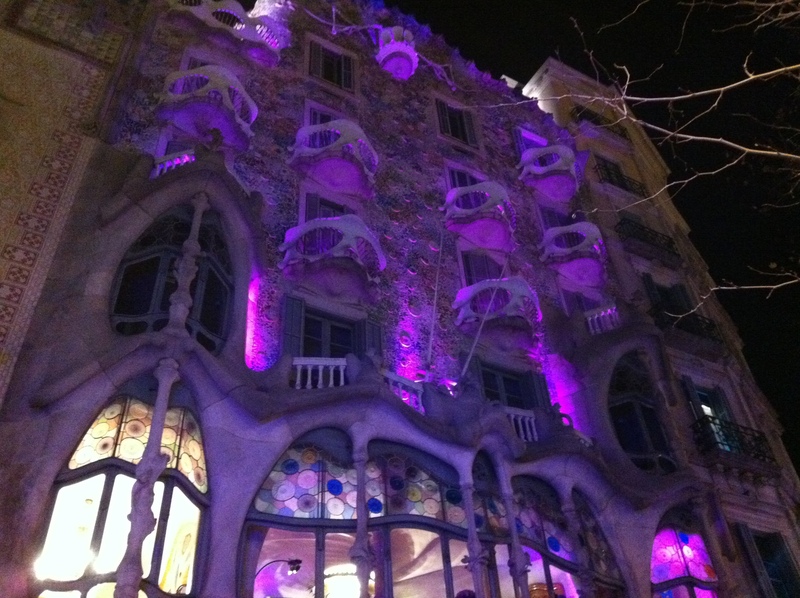 OMG – that’s Gaudi’s Casa Batlló on Passeig de Gracia! 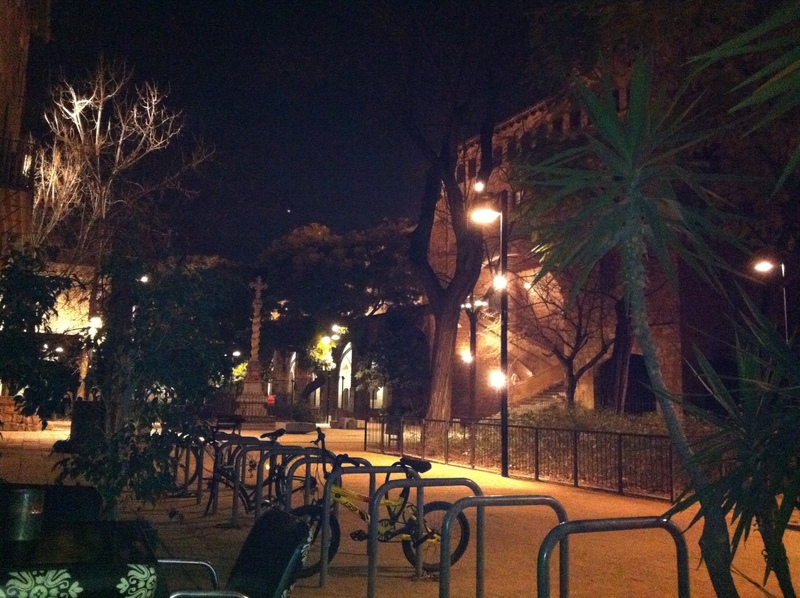 My fave of his works next to Parque Guell (which you must visit soon…) Can’t wait to troll some of these places with you in June! Spain – I loved it too! Mike (hubby) and I drove from Paris along the coast to Spain and across to Madrid. Loved the tapas hopping – looking for something novel and interesting to try. Dinner is always late into the night and it is one place where I hear the sounds of children at 10 pm during the week. Its one country that I’d go back again and again. Thanks for sharing the sights and savorings. OMG – Barcelona – Miro! Thank you for keeping in touch. Enjoy! Yey! I love Espana! Glad to hear you made it safe and sound and are enjoying the great food and sights. Did they ever finish restoration of “la sagrada famila” Gaudi church? I love his organic architecture. Thanks for sharing pictures and updates! can’t wait to see and read more about your adventures. You two should take a surfing trip to Portugal. I hear the surf there is fantastic!